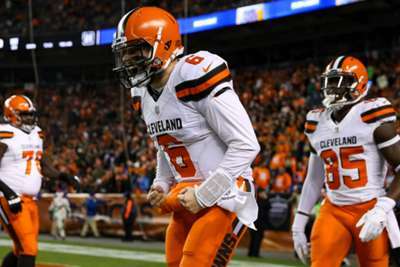 The Cleveland Browns kept their slim NFL playoff hopes alive with a 17-16 win over the Denver Broncos. Fuelled by Baker Mayfield, the Browns – who have not made the postseason since 2002 – snapped an 11-game losing streak to the Broncos on Saturday. Mayfield, who was 18-of-31 for 188 yards, two touchdowns and an interception, inspired a game-winning drive midway through the fourth quarter. The number one pick from 2018 NFL Draft found Antonio Callaway for a two-yard touchdown pass with less than 12 minutes remaining and that proved to be enough. Despite the late touchdown, the Broncos still had a chance to win the game. After getting a huge stop on four and one in the red zone, Denver got the ball back with a little more than a minute to play, and no timeouts. Quarterback Case Keenum drove his team down the field and got into Browns territory, but a sack by Jabrill Peppers on fourth and long ended the game and all but Denver's playoff hopes – the Broncos could be officially eliminated following Sunday's slate of games. 4 wins in their last 5 games. Broncos linebacker Von Miller, meanwhile, became Denver's all-time sack leader as he eclipsed Simon Fletcher with his 98th career sack.